A full line of silica gel, clay, molecular sieve and activated carbon food grade desiccant canisters ranging in size from 0.5-grams to 4.0-grams. High-density poly-ethylene (HDPE) canisters are made with food grade plastic and ink and have been given Drug Master File status by the FDA. These canister desiccants are used by many high volume pharmaceutical customers looking to achieve high speed insertion rates (up to 500 per minute) thereby increasing throughput and reducing overhead costs. 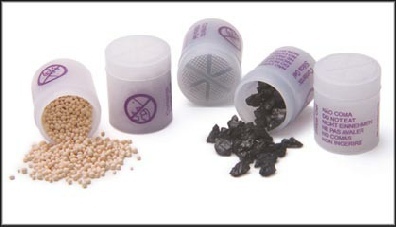 These canisters are available in silica gel, clay, molecular sieve, activated carbon, 2 in 1 and custom blends. Also available is a complete line of Drug Master File approved plastic top canisters, paper top canisters and desiccant inserts. These items are ideal for many cap, vial and bottle applications.